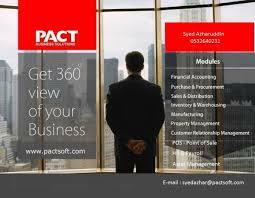 PACT constantly delivers innovative, flexible and secure software solutions while maximizing value at every step in our customers and partner relationships. We are extremely proud of our dedication to customer service, and we prize the long term relationships that we develop with our clients. Our modular business management solution for small and mid-size businesses is a fully integrated solution that allows automation of all business operations including accounting, accounts receivable, accounts payable, order management, inventory management, point of sale, asset management, payroll, etc.